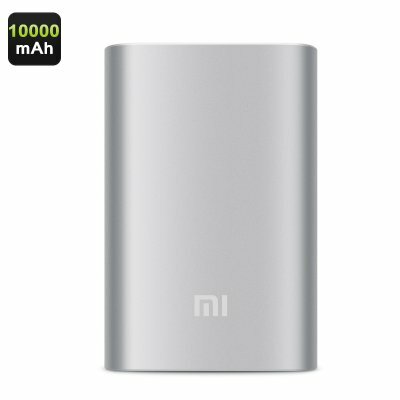 Successfully Added Xiaomi 10000mAh Power Bank - 4 LED Charge Indicators, Lightweight And Sleek Design to your Shopping Cart. Never run out of power again with this Xiaomi pocket sized power bank. Holding a massive 10.000mAh battery this power bank features enough juice to charge multiple devices. With its compact design the Xiaomi Silver power bank is extremely portable and has the perfect size to slip into your pocket. Its light weight allows you to carry around this power bank wherever you go- ensuring that you will always have the juice needed to stay connected to your friends and family. With its silver color and smooth design this 10000mAh power bank is the perfect little accessory for all tech enthusiasts out there. Featuring modern technology the Xiaomi power bank automatically adjusts the power output based upon the charging needs of your device. This offers you a safe and reliable product that eliminates the possibility of over charging and overheating alike. This compact Xiaomi 10000mAh power bank is the perfect little accessory to power up your phones, tablets, action cameras, and music players alike – letting you keep all your portable electronic gadgets fully charged while out in the wild and away from your main power source. This 10000mAh power bank comes with a 12 months warranty. Brought to you by the leader in electronic devices and wholesale power banks ..
Arabic: - مصرف الطاقة 10000mAh - Chinese Simplified: - 10000mAh 移动电源 - Czech: - 10000mAh Power banka - Dutch: - 10000mAh Power Bank - French: - Banque de puissance 10000mAh - German: - 10000mAh Powerbank - Hebrew: - 10000mAh כוח הבנק - Hindi: - 10000mAh पावर बैंक - Hungarian: - 10000mAh Power Bank - Italian: - Banca di potere 10000mAh - Japanese: - 10000mAh 電源銀行 - Korean: - 10000mAh 전원 은행 - Malay: - 10000mAh kuasa Bank - Norwegian Bokmål: - 10000mAh makt Bank - Romanian: - 10000mAh Power Bank - Russian: - 10000mAh Power Bank - Spanish: - Banco de potencia 10000mAh - Thai: - ธนาคารพลังงาน 10000mAh - Turkish: - 10000mAh güç banka - Vietnamese: - 10000mAh Power Bank. Took a bit long, I live in ZA. A month and a half, but I'm very pleased with package and condition of product. Seems to be original. Thanks very much. Will recommend.